Rickenbacker International Corporation announces the acceptance of orders for the Tom Petty Limited Edition. 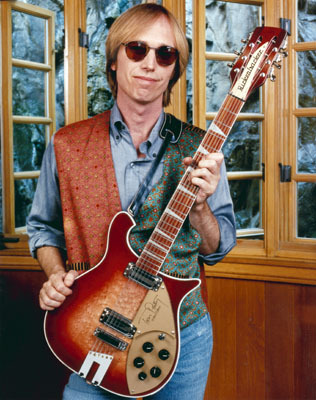 As leader of the world renown "Tom Petty and the Heartbreakers", Petty has furthered his professional accomplishments with the "Traveling Wilburys" and the success of his recent solo album, Full Moon Fever which has sold over five million copies worldwide. The Tom Petty Limited Edition, Model 660/12TP, is entirely hand made in America from solid "charactered" Eastern Rock Maple with a fully inlaid 21 fret rosewood fingerboard. Using neck through body construction, this 12-string instrument features "checked" binding, vintage pickups, vintage knobs, gold pickguard and nameplate, vintage keys designed to Rickenbacker specifications, trapeze tailpiece and a 12 saddle bridge. The neck on the 660/12TP was designed to Petty's demanding standards. A Rickenbacker vintage case is included with each instrument. The instrument is available in Fireglo and Jetglo. Information regarding price may be obtained from the local Rickenbacker distributor. The company previewed the instrument at the 1988 Summer NAMM show in Atlanta. The list price is US$1279 with a custom hardshell luggage case at $129. The model will be formally introduced at the 1991 Winter NAMM Show in Anaheim. The Company will manufacture only 1000 of these instruments. A poster commemorating the Tom Petty Limited Edition will be available through authorized Rickenbacker dealers. Each guitar will be accompanied by an individually numbered Certificate of Authenticity and Origin. Production deliveries and certificate numbers will follow order sequence.